Surely everyone who has ever been or just going to visit Rimini, thought about going to San Marino. San Marino is amazing in all respects with the state, also one of the smallest in Europe and the oldest in the world. The historic center of San Marino is only 22-24 km from Rimini centre. Such convenient location makes day trips to San Marino so popular among tourists in Rimini. Yourself to get from Rimini to San Marino can be on a rented car. To rent a car it is best if you, in addition to San Marino, plan to visit other localities or are planning to travel to Italy. Leave the car will have near the historic centre of San Marino, and then walk, good Parking can be found close to and a lot of them there, both paid and free Parking. Parking costs 1.50 Euros per hour, 3-6 hours up to 3.30 - 4 Euros, depending on Parking, from 7 hours to days - 8 Euros. To visit San Marino as part of a group tour. This tour is cheap, from 10 to 25 Euros per person. On a tour of San Marino, this is usually 4 to 6 hours. In this type of visit San Marino have both pluses and minuses. Plus the fact that all the way you will be accompanied by a guide who will tell you many interesting things about San Marino, besides the tour may include tastings of wines and liquors(or) visit the outlets of San Marino. 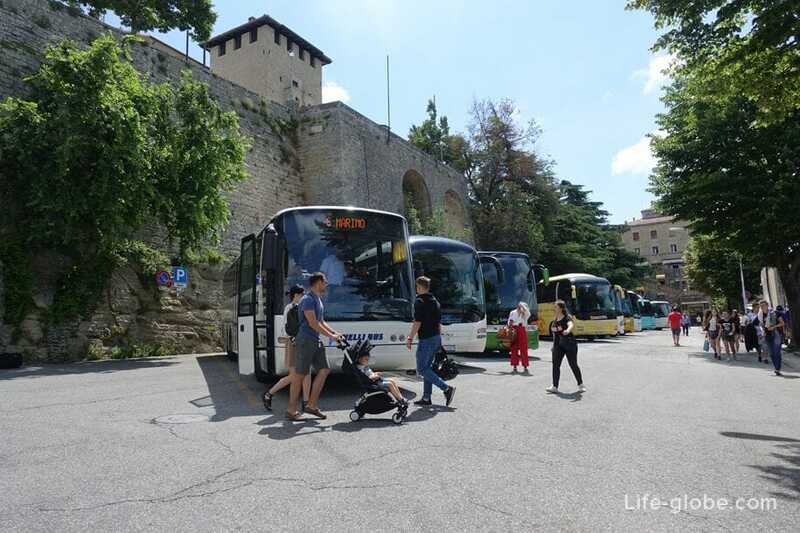 Minus is that travel time is limited and you simply may not be enough time to enjoy the beauty of San Marino, and will need to go on the bus and return. 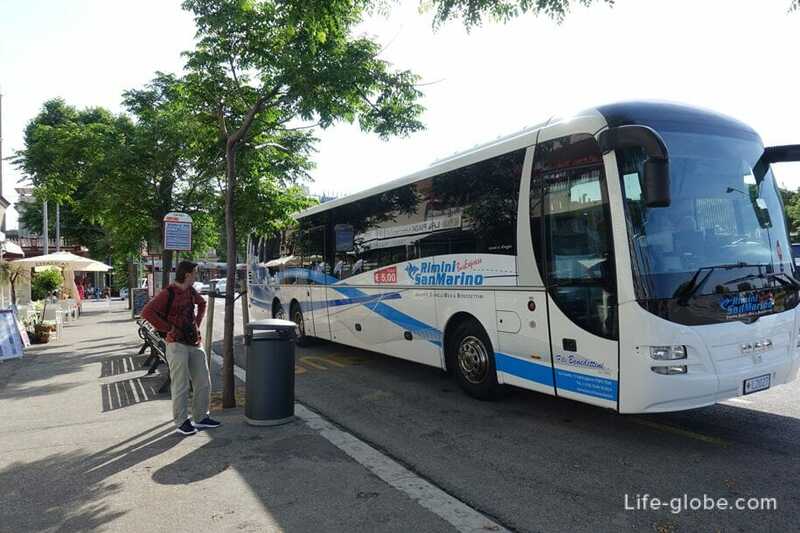 The budget option to arrange their own transportation from Rimini to San Marino bus firms Bonelli Bus (with Benedettini). Buses run year-round and daily during the tourist season even more often. Buses are large and comfortable, with air conditioning. It takes about an hour. The fare one way is 5 Euro. You can immediately buy a return ticket, the price will not change, but the ticket is already in hand, and return at any time (the tickets are not tied to time). You can buy tickets as ticket sales and drivers. 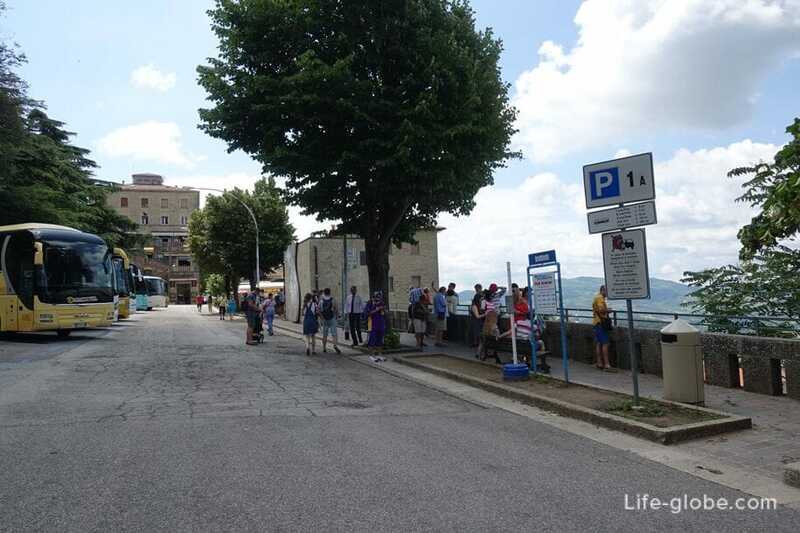 However, the priority for passengers with purchased tickets, the bus takes only seats, and in the high tourist season wanting a lot, during our trip all seats are not enough, so that some tourists were left standing at the bus stop waiting for the next bus. 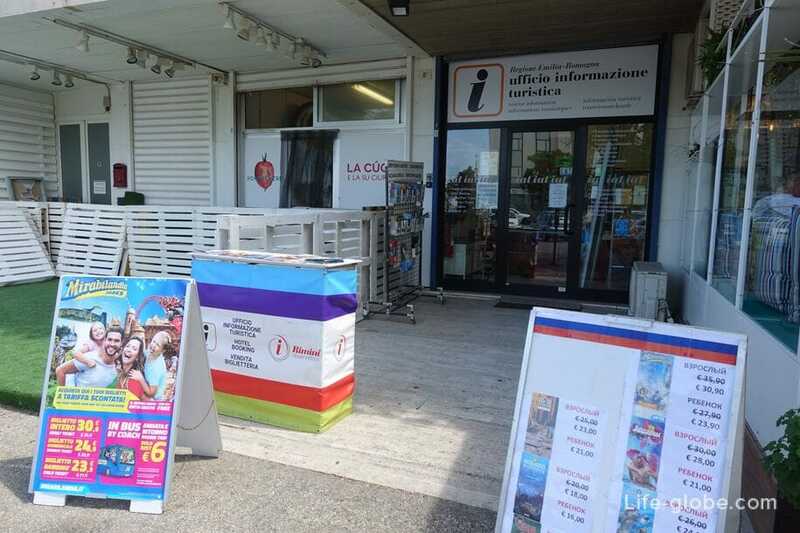 - start and end located on Piazza Marvelli (Marvelli Alberto Piazza), near the main beaches. 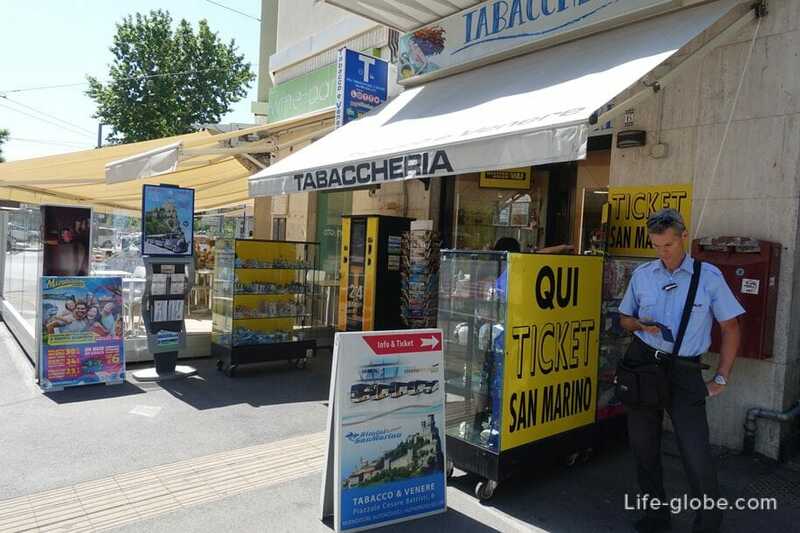 Here, near the spot, is a tourist information centre, where you can buy bus tickets and free map of San Marino attractions. It is best to take the bus at this stop, again, because of the possible option that the other stations will not be available. - the third and last stop "Arco D"Augusto" in Largo Unità d'italia. Year-round stop. 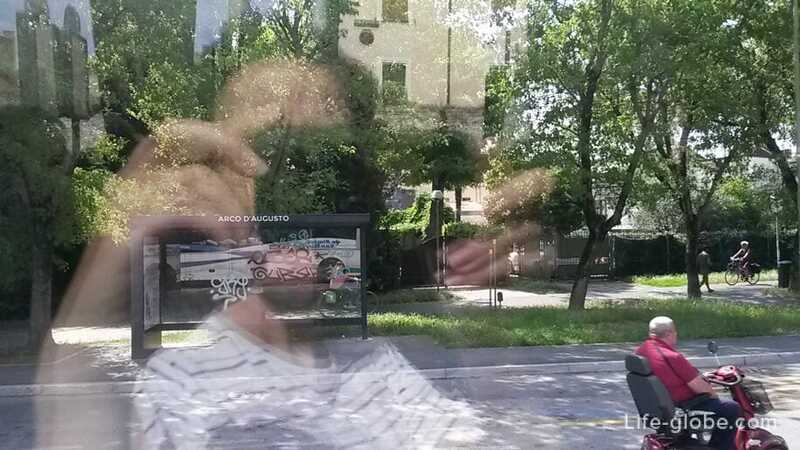 In San Marino the bus makes several stops. 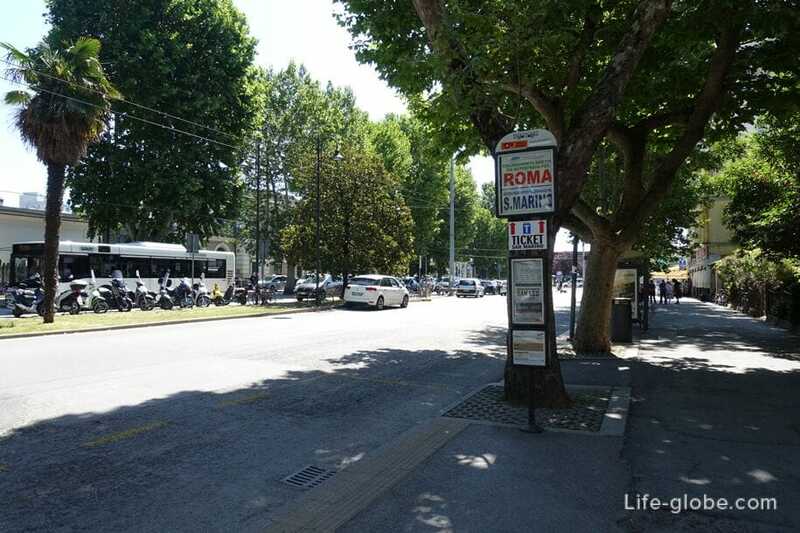 End - near the main historic centre, in Piazzale Marino Calcigni, landmark - Parada autobus Rimini-San Marino. From this stop buses start in Rimini. If you go to shopping then go early near the shopping centers. Schedule seasonal (summer and winter). In summer, from 8 June to mid-September buses run daily from 06:45 to 20:30 PM every 1 hour 15 minutes. - weekends: from Rimini to San Marino from 08:10 until 18:10 PM; from San Marino to Rimini from 08:00 to 18:00 PM. Attention! The cost of tickets and the bus schedule may change, please check before traveling on the official website of the carrier. If you plan to stay in San Marino, then you need to book your accommodation (a hotel room). There are hotels located right in the historic centre of San Marino, as well as those that are more distant from the tourist routes. All accommodation in San Marino, you can view and book here.